Watch out, mountain lions. There’s a new feline ruling New Mexico. 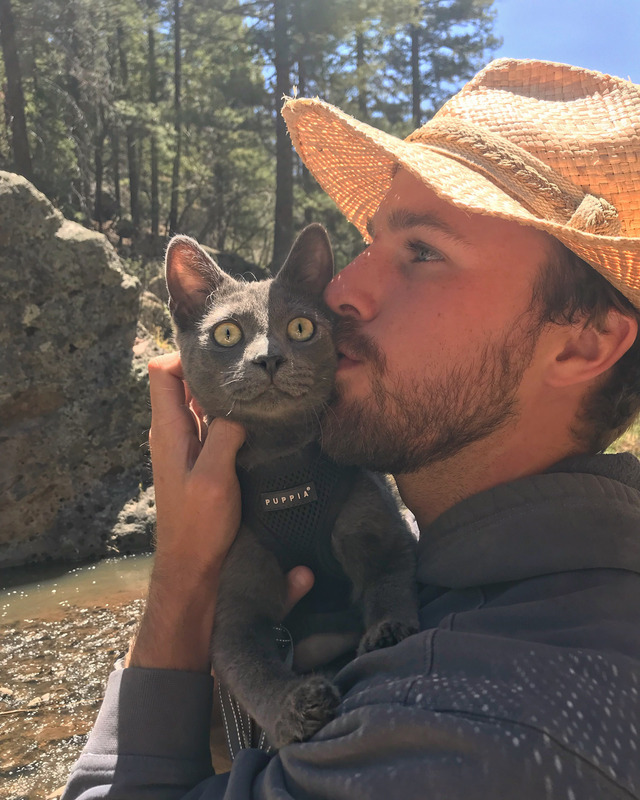 This not-so-ferocious beast, a gray house cat named Walter, enjoys hiking through the desert with his owners, Madison Larkin and Elliott Andelman. But Walter’s natural habitat is his porch in Albuquerque, where he enjoys sunbathing with his new cat brother, Kunu. “They’re amazing creatures and have such big personalities,” says Larkin. 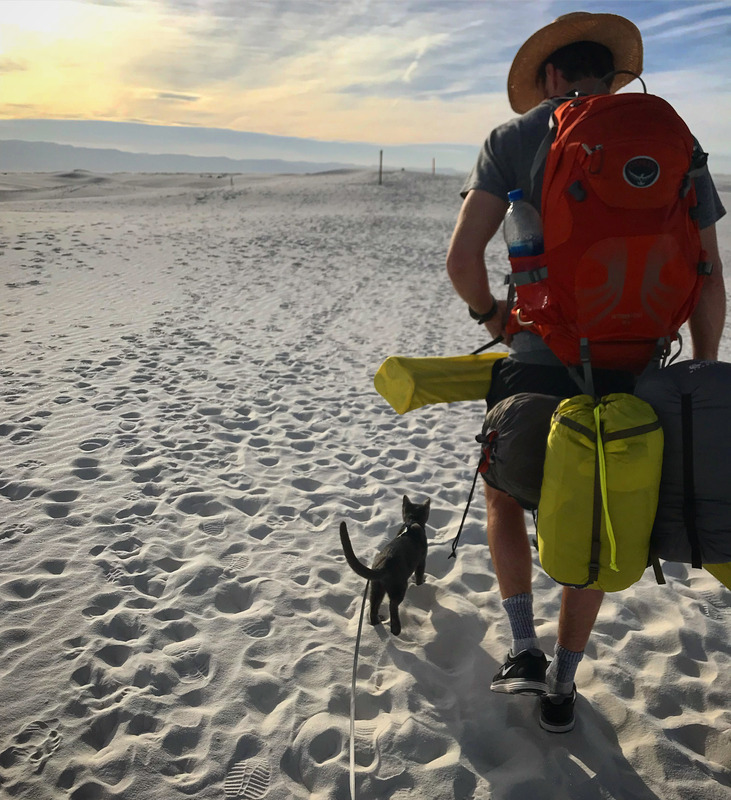 Both Walter and Kunu are desert explorers and trailblazers of the feline world. 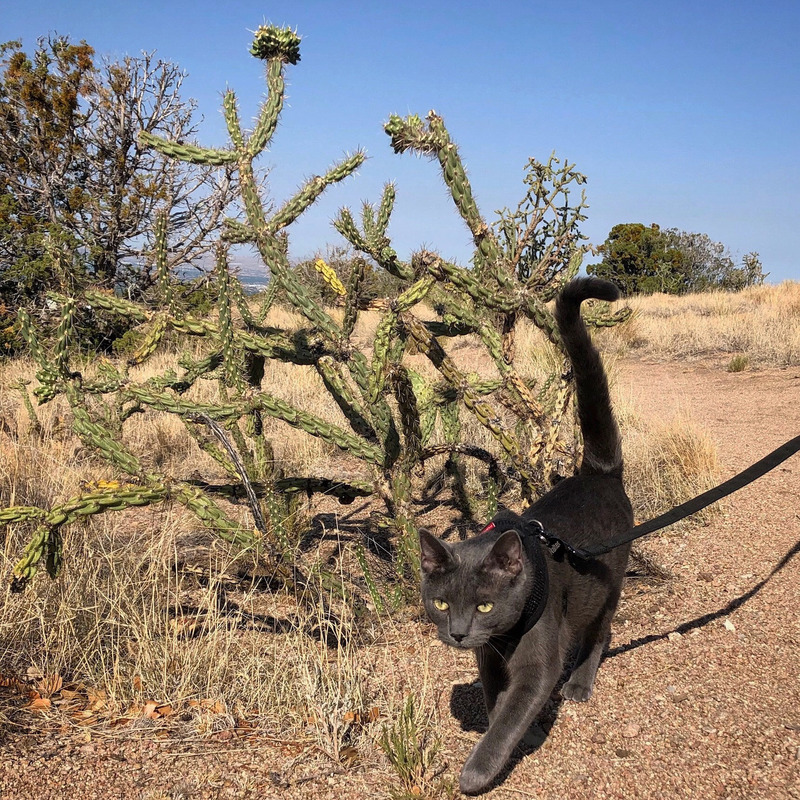 While other adventure cats trek through lush forests or sail pristine lakes, Walter and Kunu traverse the arid Southwest. Larkin and Andelman, are geologists who moved to New Mexico for work. In late 2017, they adopted Walter from an Albuquerque animal shelter when he was still a kitten. As geologists, Larkin and Andelman spend plenty of time outside, and they both love hiking and camping. 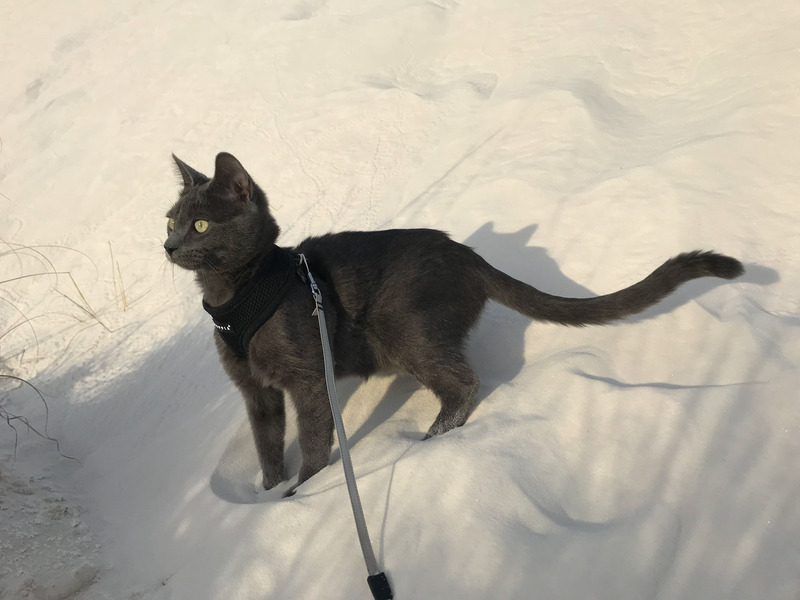 After following the travels of other cats online and seeing them as courageous companions, they decided to train Walter for adventures of his own. Walter showed an early affinity for the outdoors. His favorite thing to do is lounge on Larkin and Andelman’s porch. The couple slowly introduced him to new settings beyond the porch though, taking him on smaller trips around their apartment complex or to the grocery store. One of Walter’s first real hikes was in the foothills of Albuquerque, and he eventually accompanied his humans on longer journeys to the Santa Fe National Forest and the Sandia Mountains. Though Walter is now a veteran of adventures all over New Mexico and surrounding Southwest states, “he started by getting used to being in the car and getting out and hiking around for a short while,” Larkin says. 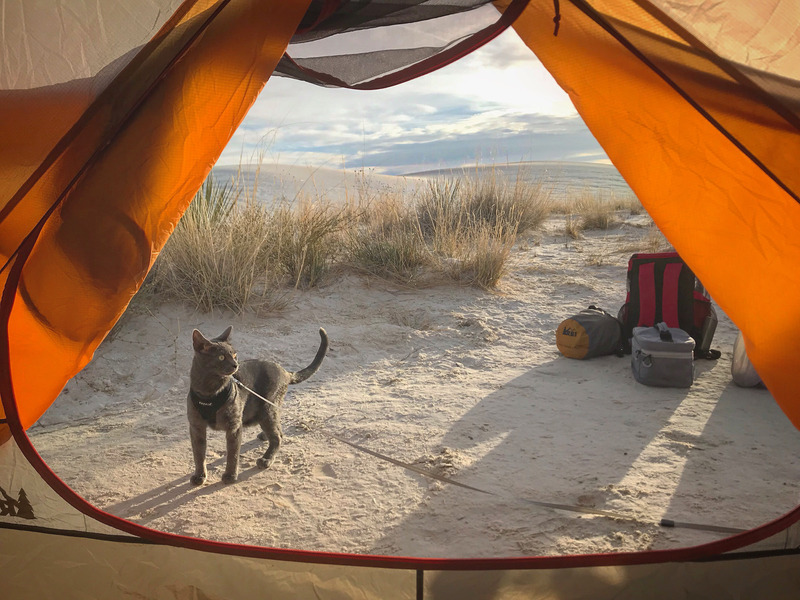 Kunu, whom Larkin and Andelman adopted from another animal shelter in August, is still learning the ropes of an adventuring lifestyle. 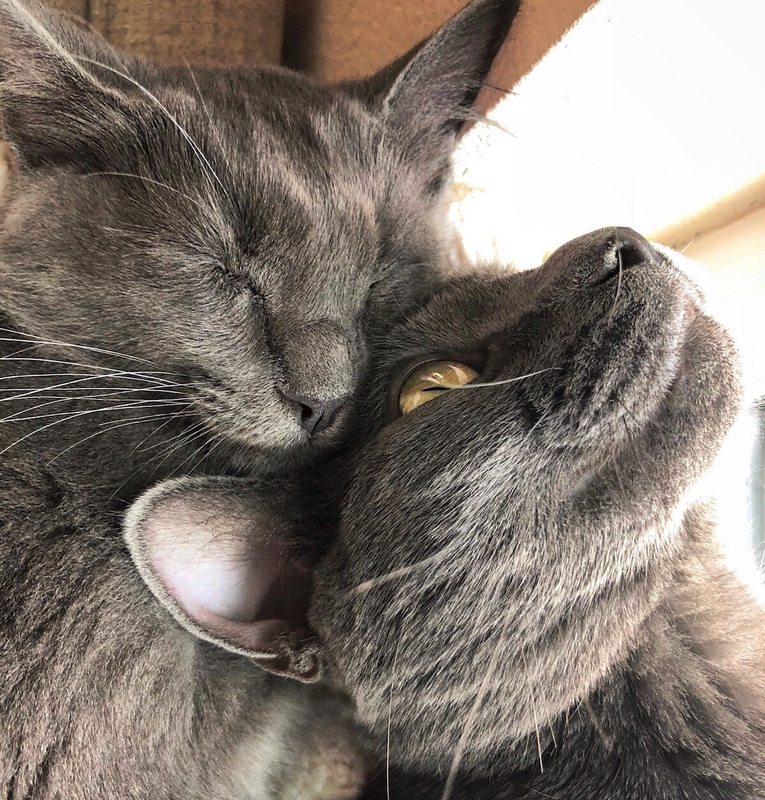 Though they aren’t actually related, Walter and Kunu look stunningly alike, making them perfect costars for their @meowalt Instagram account. New Mexico is rife with photo opportunities among rocks and cacti, but it can present special challenges for cats. Pet owners must vigilantly guard against dehydration when their animals face hot weather and dry terrain. Larkin and Andelman always prioritize Walter and Kunu’s safety. The cats always have an extra water bottle and pop-up cups on trips, and Larkin and Andelman keep them leashed to protect them from harmful plants and animals. They also seek shade and water wherever they can, plan hikes for the early morning or sunset, and take fewer trips during blistering summer months. The upside to New Mexico’s climate though? Warmer winters mean more time outside! Walter is a confident, easygoing cat who likes meeting new people and creatures. He is, however, skittish around cyclists, so Larkin and Andelman will pick him up when bikes whiz past. Kunu, for his part, is learning to ride atop people’s shoulders. MORE: What kind of harness does your cat need? Larkin recommends that cat owners hoping to leash train their feline friends start small and pay attention to how the animals respond. Taking a cat outside “develops this kind of trust between you and the animal,” she says, and she recommends the adventuring life for cats who are up to it. Adventure cats are rare in New Mexico, so Walter and Kunu attract quite a bit of attention. Gawkers and fans can slow the group’s hiking pace, but Larkin doesn’t mind answering questions about her cats. “It’s fun to see people’s reactions and give them the idea that this is something they could do too,” she says. Scroll through the gallery at the top to see more pawsome photos, and follow all of Walter’s and Kunu’s adventures on Instagram. This article was originally published by Adventurecats.org. Read the original article here.